Why Haven't We Embraced Indigenous Foods? How many Australian Indigenous restaurants have you come across? The following is a guest post from our friends at Sustainable Table. If you ate as many jelly beans as the number of Italian and Chinese restaurants you've come across in your time, you'd probably turn into one giant multi-coloured jelly bean. That is to say, you would've come across a lot of said restaurants... as well as Indian and Thai and Greek and British (I'm lumping Aussie pubs in that category). But how many Australian Indigenous restaurants have you come across? You'd hardly fill up on those jelly beans, I bet! Same goes for native spices in our everyday cooking. Ask those around you if they've tasted cumin, coriander, cinnamon and all those exotic spices and you'll pretty much have a clean sweep of affirmatives. But ask for wattleseed, strawberry gum or kutjera enthusiasts and crickets will chirp. Chirp chirp. Let's face it, as a nation of eaters, growers and sellers, we've been awfully slow at embracing our own produce, there's no question about that. The question is why? Nor is it for lack of nutritional value. Research is quickly revealing bush foods as superior sources of vitamins, antioxidants and minerals – our very own 'superfoods'. 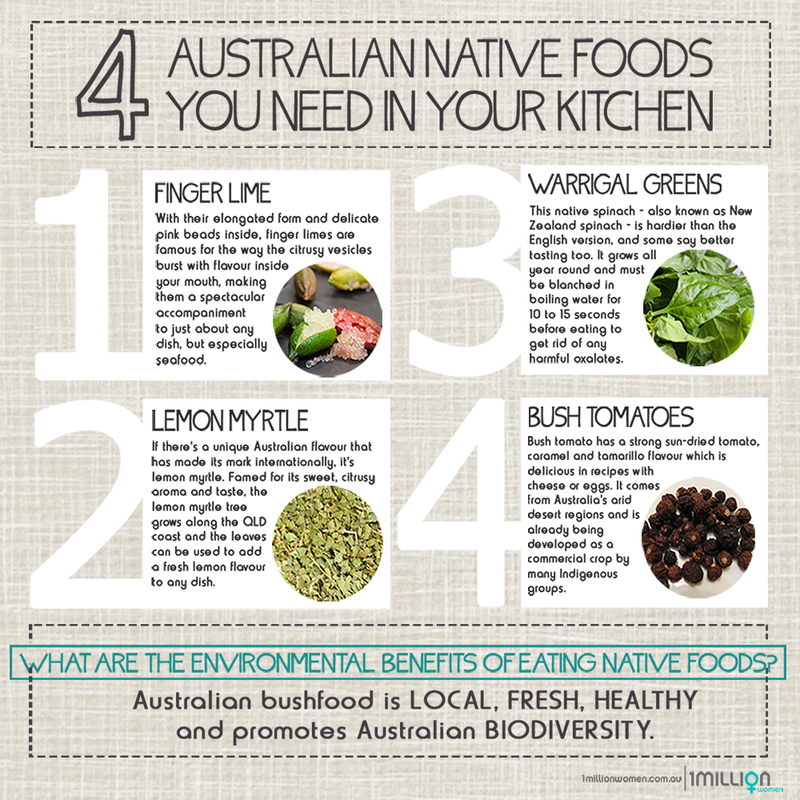 It wasn't until the 1990s that a small-scale revival of native foods, or bush foods, began to emerge. But it's still a slow-burning revival. Admittedly, another reason is that bush foods are challenging to cultivate on a commercial scale. Most of the native produce we find in stores today is harvested from the wild, but as demand increases this supply chain could soon be unsustainable. A sustainable method of cultivation, then, may be a necessary part of progressing the industry and expanding our access to native foods. For this reason, the CSIRO is currently developing ways to cultivate bush food on a commercial scale. Many bush foods also have incredibly short seasons, meaning a consistent year-long supply might not be possible. That might deter big businesses from signing up. Perhaps, though, these challenges say more about our contemporary shopping and eating habits than why we can't or shouldn't embrace bush foods. We expect to be able to eat tomatoes all year round. We take trips to the shops to source our food and we're used to seeing produce in abundance. In short, we have a history of altering our food and farming methods (through science and tinkering with the environment) to suit us – perhaps we are at a turning point where we could, for the first time in our culinary history, change our eating and food-sourcing habits to suit our food. We could, for instance, learn how to grow native edibles at home - because these plants are bred and born here in Australia, they're perfectly suited to our challenging climate and require far fewer resources to grow. We could embrace the short seasons, learning to cook with and savour whatever produce is available at the time. We could learn to cook with a greater diversity of produce, so that availability of only small quantities of each type of bush food isn't such an issue. Try cooking with the Australian bush foods above to start. Maybe the key to it all is education. I know I'm speaking for the whole Sustainable Table team when I say I've never been taught how to use native ingredients. Yes, maybe we need to be better educated about why and how we should grow and eat indigenous produce. Ah-ha, the perfect segue then to our resource Go Native, a free native plant and recipe guide featuring the top edible natives to grow in your own yard as well as recipes, nurseries and online stores so you can stock up on native ingredients. Download the guide for free and let's all learn about, celebrate and embrace what is our very own uniquely Australian cuisine. Even if we're over 200 years late. Grow your own! Gardening is good! Growing your own food instills a true sense of the value of food, and it’s not difficult. Large yards with plenty of sun can grow enough vegetables and herbs to significantly supplement your household needs, and even small homes and apartments can have herb pots.